NP designer is the Software of Omron to develop HMI screens for NP Series HMI's. It is a simple to use software. Subscribe to Automation-Talk by Email. Just see our HMI Tutorial below to Learn. 1.First open the NP Designer software and click on New to start a New Project. 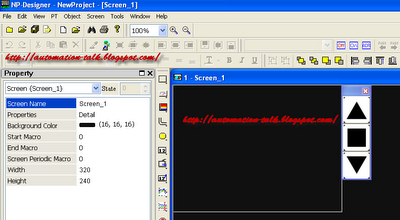 2.Now Just give name to your HMI Program ,choose the Protocol,host name etc. 3.Now you will see your 1st screen of the HMI , name it according to yourself. and go to Objects to select your objects like buttons, Meter ,Alarm,Inputs,display etc. to make your first Screen. This is how you start with NP Designer ,if you want any help please feel free to ask.